Bored with the same old watering holes? Well, you’re in luck, because Botanist is getting ready to shake up Vancouver’s cocktail scene. “That’s the intention,” says creative beverage director Grant Sceney. Botanist is the new bar and restaurant that will open later this month in the former Oru space above the Lobby Lounge at the Fairmont Pacific Rim. But this won’t be just any hotel bar. This is the creative playground where two of the city’s most talented bartenders have been set free to do what they do best: make inventive, finely crafted drinks. 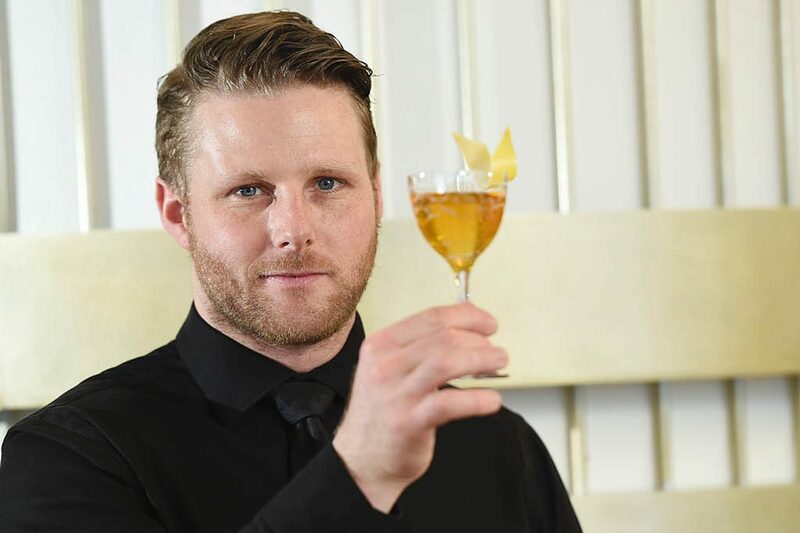 Sceney placed sixth in the world in Diageo’s prestigious World Class competition in 2014, while head bartender David Wolowidnyk won the 2012 Bombay Sapphire Most Imaginative Bartender in the World competition. They’ll also have smokers, aroma vaporizers, gadgets for making dry ice to order, a refractometer to measure sugar content and a pH metre to test acidity, as well as all the other cocktail gear a creative bartender could dream of, except a Clinebell ice-block machine, because it was just too big for the space. Now, if all this emphasis on science and gadgetry makes you think the drink program is going to be all about molecular mixology, think again. “It’s not molecular, no. That’s not the approach. It’s just going to be a greater control of the environment. It’s going to be exciting,” says Sceney. Adds Wolowidnyk: “It’s not going to be where someone orders a rum and Coke and we give them a gelatinous cube.” What Sceney hopes is that the lab will allow them to bring the kind of wildly-innovative drinks bartenders create in competitions to consumers; too often, it’s impossible to recreate those grand ideas within the busy demands of service. The lab gives the bartenders the space and time to be creative without interruption, where they never have to worry about tools going missing or the kitchen “borrowing” their ingredients for dinner service. It’s a precious rarity in the hospitality business. It’ll be fun for customers, too, Sceney says: “The lab is an extension of the bar, except it’s glassed in. Guests will be able to sit there and watch people work in the lab. There will be a couple of drinks carried out of the lab with a more elaborate presentation.” The lab will also allow the team to work toward perfection and to achieve a level of accuracy and consistency that is challenging under typical hospitality conditions. “There’s been this constant ‘why’ in our minds. Are we actually satisfied with this, or can we make it better?” Wolowidnyk says. Before the team at Botanist installed the bar top, creative beverage director Grant Sceney “bought a drink for the next generation of bartenders” by embedding a bottled cocktail, a handwritten note and a copy of the first bar menu inside the bar itself. This is the cocktail they left for the future: an updated version of the classic Vancouver cocktail. “We’ve made the Vancouver Cocktail as Vancouver as we can,” says Sceney. Place all ingredients in a mixing glass with ice and stir until chilled and diluted to your satisfaction. Strain into a chilled coupe. Garnish with a lemon twist. Serves 1.